REMOTE CONTROLLED AIR CONDITIONING ZONES THROUGHOUT. 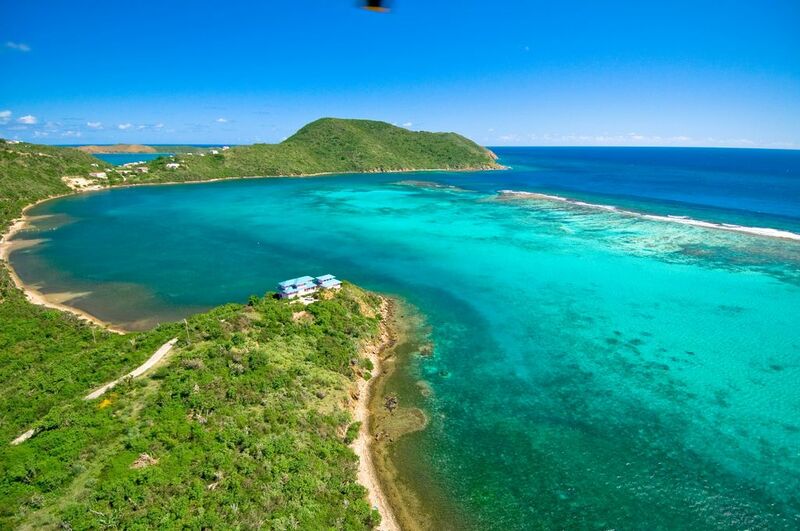 A very special private waterfront Virgin Gorda villa for rent on its own private peninsula , this 7-bedroom vacation rental home sits at the end of Mattie Point, with water on three sides and Gorda Peak behind. South Sound is a spectacular secluded area of Virgin Gorda, where you hear the waves breaking on the reef and your neighbors are pelicans, turtles and fish. To one side you'll see the Hurricane Hole and to the other is Great Hill. On the far side of Great Hill are fun places to visit such as Biras Creek, Saba Rock, and Bitter End Yacht Club, all on Virgin Gorda. Swim in the infinity edge pool overlooking the sound or snorkel, scuba, swim off our private dock to some of the best underwater viewing on the island of Virgin Gorda. If you're a little more adventuresome, take the 12' dinghy or one of our three kayaks out to the 5000 foot reef for more snorkeling fun or motor over to the Hurricane Hole for exploration or go to a private beach. Thrill seekers may even want to try out our kayaks on South Sound. This Virgin Gorda rental vacation villa has been designed to let the ocean breezes and sunlight surround you. The tile main floor is a free flowing area, including a living room with a built-in CD entertainment system and 55 inch HDTV, dining room and fully equipped kitchen with an prep island and seating bar for drinks. Our living room has a sofa, a love seat ,other chairs and tables. It also has a new built in cushioned seating area in the bay window. Glass sliding doors along both front and back of the villa open to beautiful ocean views of Virgin Gorda. A 12 foot wide covered front deck stretching the entire length of the house (54 FT)is a great place for a casual lunch, a romantic candlelit dinner or your afternoon nap in the hammock or 1 person hammock swing. The 8 foot wide garden deck, with a propane stainless steel BBQ Grill, will give you all the sun you want. Even the main floor bathroom extends into the outdoors, through sliding glass doors to the glass block enclosed double shower. The kitchen is equipped with a large side-by-side ice maker new GE refrigerator, new GE microwave, dishwasher, and electric self cleaning four burner range. A complete set of kitchen utensils, small appliances and cookware is provided as well as glasses/dinnerware for 16. We also maintain a large selection of spices and basic condiments/supplies for your use. We also have a wine cooler in the dining room. Upstairs, you will find two bright and cheery bedrooms with tiled floors, walk-in closets, seating for two and overhead fans. Each bedroom has a private outdoor balcony overlooking South Sound One bedroom has a king size pillow top bed, and the other has two twins. The bathrooms feature oversize showers. Great views of South Sound and the mountains of Virgin Gorda that surround it. Extra guests can sleep on the day bed, queen blow up mattress and the sofa in the living room. We also have a pack n Play for the little ones. The horizon edge 12,000 gallon pool is 5ft to 8ft deep with its own rock waterfall and lots of tile decks all overlooking South Sound. The pool deck has 8 chaise lounges and a 50 inch table with four chairs. If you want to lounge near the pool, but be out of the sun, enjoy our covered deck, which also has a 50 inch table, four more chairs and an entrance to the lower shower. Enjoy a drink at our covered poolside wet bar. Our pool wing has five more bedrooms and five bathrooms in a separate structure, connected by a bridge to the Main House of the villa and overlooking the pool. The main floor includes the master bedroom area, a second bedroom, a bathroom with a glass block enclosed shower, and a covered veranda with chairs and tables, overlooking the pool and South Sound. The master bedroom features tiles on the floors, a sitting area , love seat and tables, 12 foot glass sliders to the veranda, views of South Sound on three sides and a king size pillow top bed. Another bedroom with floor tiles is on the main floor and is furnished with a queen pillow top bed, overlooks the pool and has glass sliding doors opening to the veranda.The pool deck bedroom has Mexican tiled floors, a queen pillow top bed, overlooks the pool and deck and connects to the lower level bathroom and shower. The top floor bedrooms a queen size pillow top bed, tile floors and provide 360 degree views of South Sound and the mountains that surround the villa. Each bedroom has its own closet, bathroom with shower and accessory seating. Lush tropical landscaping surrounds the villa and pool. We have selected a wide variety of flowering plants as well as trees. The villa has a cement access road as well as cement driveways/parking area and perimeter fencing/cattle guard to keep cattle out. The villa telephone system includes an answering machine and 6 line wireless phones. Ask us about our very popular special low rates for incoming and outgoing telephone service to the USA/Canada/other international calls. Lets you keep in touch. Cellular service , WhatsApp and GSM phones do work on the island. Ask your existing carrier for international roaming , which would allow for the use of your existing phone to operate in the BVI. E-mail me regarding specifics on how to do this. Android, iphones and Blackberry devices will operate with the villa wireless internet. Wireless high speed internet service (802.11b/g) is available throughout the villa. No security code is needed. 2) Overhead fans are in the living and dining rooms and all bedrooms. 4) A new washer/dryer is on the lowest level of the main house. An iron and ironing board are also provided. 5) A 2 person kayak, and two 1 person kayaks are available for your use and kept at our dock. A 12' fiberglass dinghy and new 18 HP outboard motor for use at additional cost of $300/week. Our dinghy is kept out of the water with our new boat ramp with hand winch. 6) The CD sound entertainment system has speakers in the living room and outdoor deck. Bring your favorite CD's or listen to ours. ipads can be connected to the system. 7) The villa kitchen is furnished with a coffee maker, coffee bean grinder, blender, food processor, wine cooler, four slice toaster, mixer, electric can opener, electric knife, electric wok, electric fondue pot and lots of tools. We also provide basic condiments and spices. 8) Our new dinghy ramp with a winch makes it easy to launch and retrieve the dinghy/outboard. We recommend you keep the dinghy out of the water unless it is being used. 9) Take the stone walkway to the our dock for boating, swimming, snorkeling, and scuba diving in South Sound. (Water shoes or snorkel fins recommended). Relax on our waterside 15 ft X 15ft dock with great views, fresh water enclosed shower and cooling breezes. 10) Beach towels, beach mats and food coolers are in the Main Villa House. 11) 4 scuba tanks . Scuba equipment is not provided. 12) Soft Baby crib for the little ones. 14) Outdoor Propane Stainless Steel Grill Utensils are in the kitchen. 15) Backup automatic full house Generac generator, so you will never be out of power. The unit detects loss of government power, starts the propane powered engine and provides power to the villa as long as the government power is out. When the government power comes back on, it will shut down. Completely automatic. Our rental rates include the BVI villa rental tax and maid service midweek and weekend of your stay. Other arrangements can be provided. The South Sound Road, which leads to the villa, connects to the main Virgin Gorda government road, running between the Valley and Gun Creek. The South Sound Road is a one lane island road about 1 mile long, which goes through pasture land with cattle and is level and flat and easy to drive on. The cattle are peaceful and will cause you no harm. If they happen to be in your way, just slowly pass by them. We recommend a rental car be secured for your transportation while on Virgin Gorda, with several different types of rental vehicles available. We can arrange a rental for you and have the agency we work with pick you up at your point of entry. They will have the villa key, as well as a map to guide you to the villa. You can view the cars they have available by going to the link near the bottom of the page. Select the car you want and we will reserve it for you. Contact us for details. Secluded and Private. Lots of room. Waterfront on 3 sides. Private Dock with kayaks, dinghy with outboard and fresh water shower. The villa is the largest rental villa on Virgin Gorda, and is completely new. The views are spectacular as are the views from the numerous balconies, deck and verandas. There is an enclosed fresh water shower on the dock. Used for the owners car. We also provide condiments as well as a full set of kitchen implements. Horizon Edge Pool overlooks South Sound and the mountains. 2 kings, 3 queens, 2 twins, 2 sleep sofas. Horizon Edge Pool, outside showers, Dock: 1fiberglass dingy with new 18 HP engine (Additional Cost of $300/week), Snorkeling / Scuba, 3 Kayaks Wireless High Speed internet access throughout the villa. Telephone system with 6 wireless phones . Low cost USA line for calls to/from USA Stainless Steel BBQ with Utensils, Automatic turn on Whole House Backup Generator gives you power in the event of power loss. We had a great stay at this villa and had our granddaughter and a friend visit, too. We "older" folks loved lounging on the large deck, lazing around the pool, swimming, kayaking while the younger adults enjoyed exploring the night life on the island, too. The villa has lots of decks - each one of us could have had their own! The scenery is gorgeous, the breezes wonderful. It's quick to get to shopping, restaurants, the Baths, other beaches. Definitely worth a repeat visit. Amazing scenary..Such a beautiful colorful Place..The home is pink- and we all know Pink is Fabulous!! Just a splendid overall experience relaxing on the hammock, taking the dingy along the shoreline and snorkling along our own private inlet..The towns Leverick bay and Spanish town are Great..Lots of Great restaurants..but the home is fully equiped for cooking and BBQ if you choose to stay in I highly recommend this rental..One of a kind privacy and amazing scenary!! LOVED!! My favorite location on the planet! We have traveled all over and Virgin Gorda is absolutely our favorite place to vacation. The location of this villa offers some of the best of what Virgin Gorda has to offer. The views are amazing from every room. We love to sit on the porch and watch the birds, turtles, and fish down in the water. The snorkeling and scuba diving from the private dock is amazing. Thanks for your review. Virgin Gorda is one of my favorite places to go and I love being at the villa. Hope you come again. We have been fortunate to be able to visit Virgin Gorda 8 times since 1984. The island, with its friendly people, gorgeous views, beautiful beaches, and, of course, the unique Baths, has maintained its slow-paced charm and is our favorite place for family vacations. Now there are 15 of us and South Sound Villa was the perfect spot for us to stay. The 6 bedrooms are located in two wings, so the late risers were separated from the young children in the mornings. The multiple porches and decks allowed those who wanted to be away from the gang for a while to do so. The large living area was an ideal place for everyone to be together. There was something to do for everyone - splashing in the pool, with its double waterfall, kayaking or snorkeling off the dock, exploring the bay in the dinghy, or just finding a quiet place to read. The incredible views from every window and the brilliant rainbows following brief showers were the icing on the cake. The owner, Thorsten Cook, was a pleasure to deal with. We can’t wait to return to Virgin Gorda and South Sound Villa. Thank you for your kind review. Indeed Virgin Gorda is a wonderful place to vacation. I believe the island has improved year to year for its residents and those to wish to visit and enjoy the climate and the beauty of the area. Thanks for staying at my villa. It was a dream for me to build it and now that it is a realty I surely enjoy visiting. We were torn between Virgin Gorda and Tortola and were so happy with our decision. The house is everything in the description and more. From the very first contact with Thorsten, everything went smoothly. He patiently answered our questions, booked our rental car and was always available for assistance. The house is clean and very roomy. We had ample room for our group to spread out. The beds were so comfortable and the location was secluded yet close to everything. Anything you will need is already in the house. We spent hours in the pool and the hammocks. Our stay was simoly spectacular, and we came home with incredible memories. If you're still searching- look no further. This is the place! Thank you for your kind words and review of the villa. I am pleased you enjoyed the villa and Virgin Gorda. I believe there is no better island than Virgin Gorda for a vacation in the sun. Pam and I thank you for choosing our villa and hope you return again. This was our second time at South Sound Villa and it now seems like home. The views from the estate are breathtaking. The owner added a new refrigerator and a new boat this year. The house was in perfect shape when we arrived. We are getting to know the people in town who make us feel like part of neighborhood. Sometimes its hard to describe how beautiful this property really is. The only way I can explain it is "HEAVEN ON EARTH"!!!!!! Thanks Mr Cook for letting us enjoy this wonderful place. Thanks for your review of our villa. We are pleased that you have enjoyed your time at the South Sound Villa. We endeavor to keep the villa in tip-top condition. The South Sound Villa is located on a peninsula overlooking South Sound on three directions. The back of the villa faces Gorda Peak, which is 1500 ft high. The villa is surrounded by gardens that are full of flowers year round .